The shire (township) of Hervey Bay is situated along the east coast of Australia and includes North Fraser Island, a World Heritage area. Like many coastal townships along the east coast of Australia, Hervey Bay is experiencing strong population growth. Within the last decade the shire's population doubled to more than 44,000 persons and is expected to nearly double again to more than 77,000 people by 2021. Consequently Hervey Bay faces a major land use planning issue in supporting the growth of the area while protecting its natural amenity and ecological significance. Together, the Australian Research Council, the Queensland Department of Local Government and Planning, and the Hervey Bay City Council developed a sustainable development-based land use scenario for the shire using ArcGIS 8 and a GIS-based planning support system (PSS)--What if? 1.1--developed by Community Analysis and Planning Systems, Inc. (Hudson, Ohio), an Esri Business Partner. What makes this project special is that a strategic planning scenario for Hervey Bay 2001-2021 has been formulated based on the principle of sustainable development by working closely with the Hervey Bay City Council's Integrated Planning Unit (IPU). The compare scenario functionality in What if? enabled council planners to undertake visual comparative analysis of different alternative urban growth scenarios generated for Hervey Bay 2021. The diagram above illustrates two resultant land use patterns based upon different sets of user specified input values. 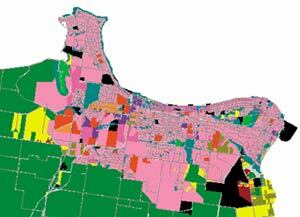 The No Land Use Controls scenario scatters residential development (show in magenta) across the shire to areas outside the map window extent. 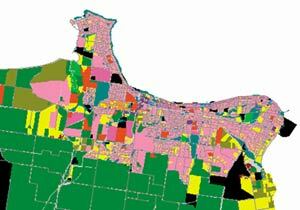 The Land Use Control scenarios concentrates residential development within and around the city of Hervey Bay (shown in map window extent), filling in undeveloped land tracts (shown in yellow) and rural urban fringe areas (shown in green). A number of socioeconomic, physical, and environmental data inputs were acquired from a wide range of national, state, and local government agencies and used to formulate the strategic planning scenario. Core physical and environmental data inputs include cadastral land parcels, building footprints, road, sewer, water, land use, remnant vegetation, national parks, state forests, riparian vegetated areas, coastal wetlands, areas of prime agricultural land, areas of indigenous significance, and existing open space. ArcGIS was used to manage the various data sets and enter them into What if? 1.1, allowing the Hervey Bay City Council IPU to quickly begin running and testing various planning scenarios. The process was iterative in that a number of draft scenarios were formulated and compared before the final scenario was derived. The formulation of each of the draft planning scenarios required the council planners to specify which suitability factors would affect the future allocation of specific land uses. What if? presented the planners with an intuitive and easy-to-use graphical user interface that allowed alternative land use scenarios to be generated on the fly. Hervey Bay Integrated Planning Coordinator Doug Mackay comments, "What if? enables the planner to easily test out possible alternatives by adjusting 'weightings of importance' and rerunning numerous planning scenarios." The final scenario generated for Hervey Bay focused on the principle of sustainable development, incorporating areas of both environmental and economic significance and allowing trade-offs to occur between these sometimes conflicting concerns. The Hervey Bay City Council IPU developed the final set of suitability factor weightings and ratings used to generate the digitally developed future land use strategy. By overlaying the existing city boundary, the existing land capacity of the city was analyzed with respect to the projected land use location-allocations for 2021. The results show that the existing city boundary needs to be extended to accommodate the projected increase in low-density residential and park-residential land use categories. In rural and coastal local government areas in Australia, strategic plans are updated and gazetted (published) approximately every five to six years. Traditionally these plans have been laboriously formulated through the use of expert knowledge and visual interpretation of paper map outputs and tabular information. Tools such as ArcGIS and What if? 1.1 allow alternative scenarios to be generated easily, tested and regenerated, and presented to council members and the community for feedback, improving the decision making process. "By maintaining strategic planning information within a GIS," says Mackay, "it is a lot easier to go back to the drawing board and modify plans based on constructive feedback given by Councilors and the general public." For more information, contact Christopher J. Pettit, RMIT University, Department of Geospatial Science, GPO Box 2476V, Melbourne, Victoria 3001, Australia (tel. : 61-3-9925-3271, fax: 61-3-9663-2517, e-mail: chris.pettit@rmit.edu.au), or visit www.what-if-pss.com.